I've been doing a lot of brainstorming and I am excited to announce the next series of Sewcabulary posts. Over the next few months, we'll be discussing the basics of garment construction. These are words that you'll see in clothing pattern instructions that, if you're a beginner sewist, likely don't know yet. We'll cover one or two techniques per post, but I would love it if you would comment with terms you'd like some help with, that way I can make sure we cover everything! 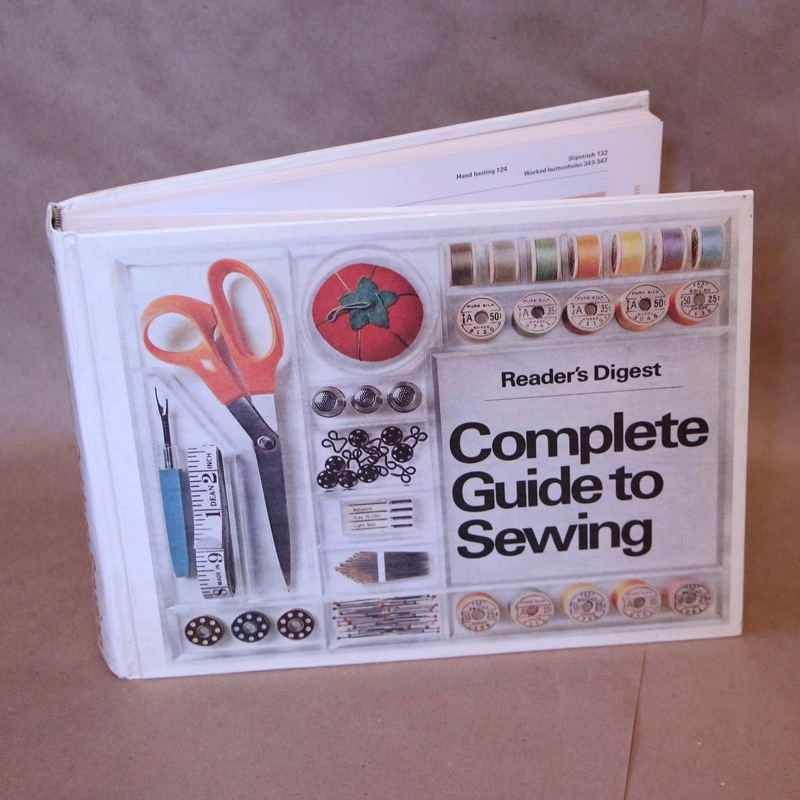 Also, I'd like to recommend something to you: a sewing book. 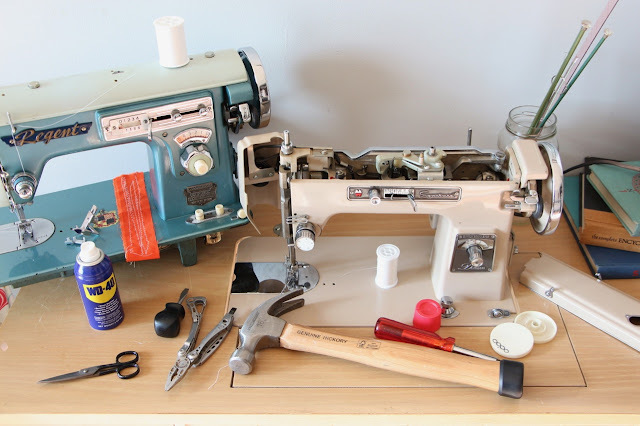 There are many good ones out there, but the vintage Readers Digest "Complete Guide to Sewing" , "The Vogue Sewing Book" and "The Sewing Book" by Alison Smith are hands down my favorites. Do you already own one and love it? Let me know! 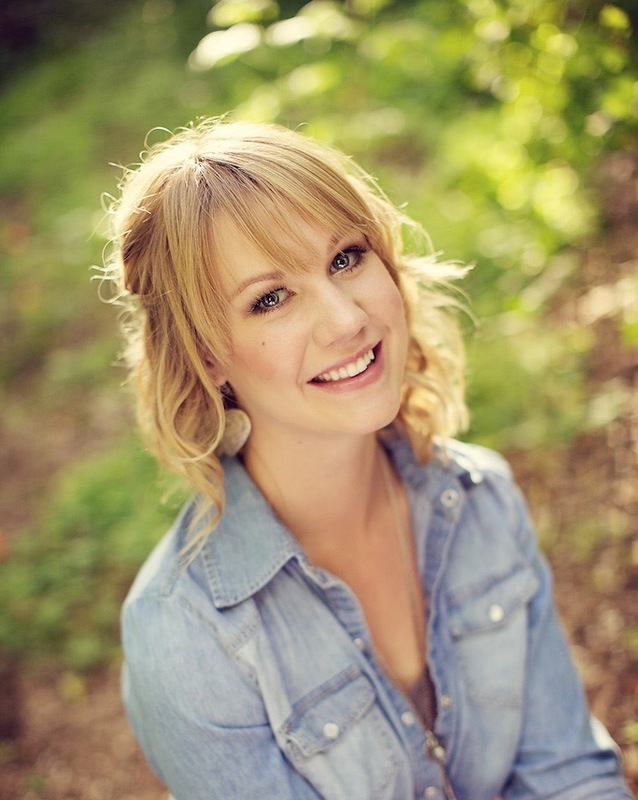 I'd love to find a new favorite. These books with have a wealth of information that I could simply never share in a thousand blog posts. These books are beautifully illustrated and will give you some awesome information in addition to these posts. 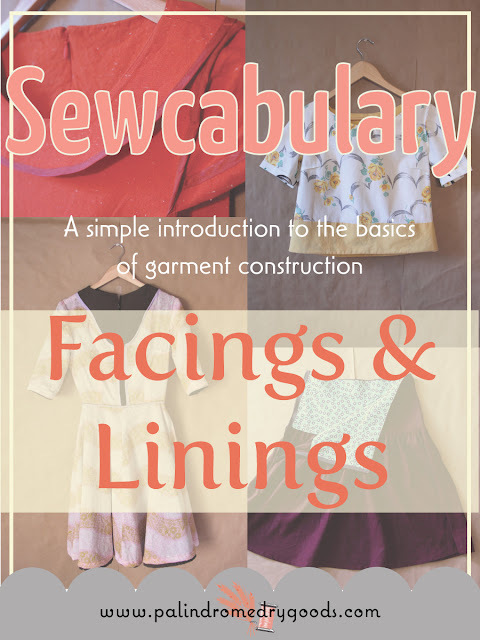 Think of it as a study guide to the Sewcabulary series! 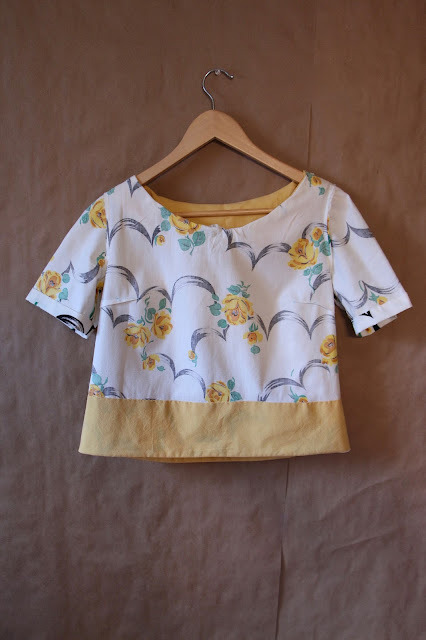 Facings are pieces of fabric used to finish raw edges and are typically found at the neckline, armhole, and front or back openings and the hem. 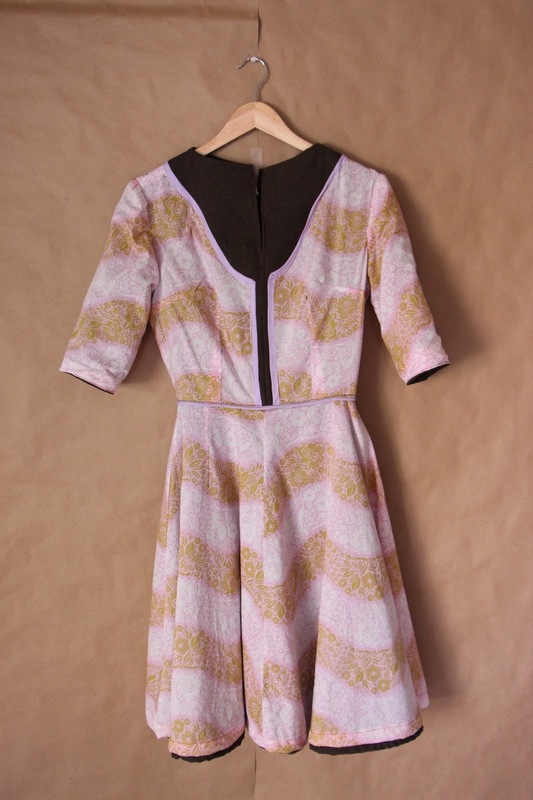 Let's take a look at inside of this dress, which, by the way, I did not make. 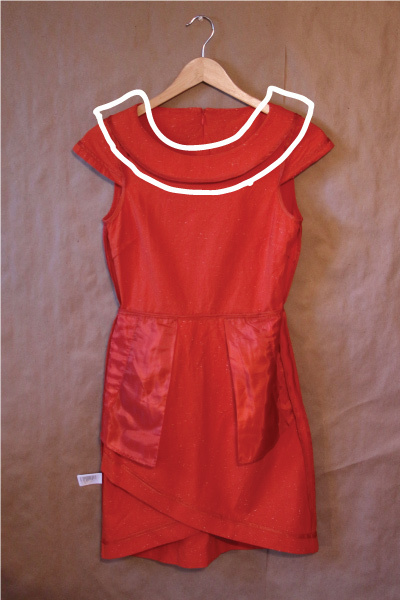 The facing on this dress can be found at the neckline. 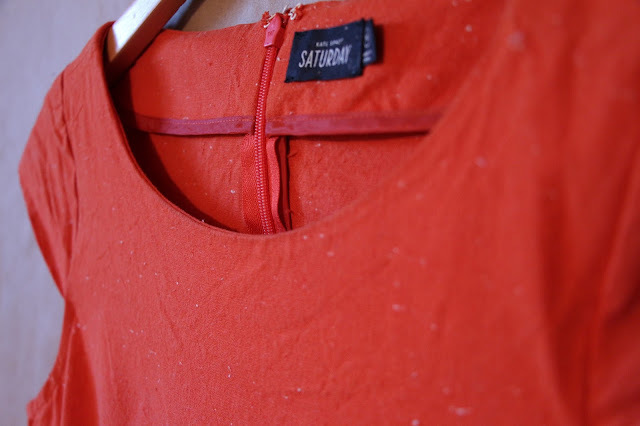 Facings are applied, right sides together, to the outside of the garment and then turned to the inside of the garment so that we have a beautiful, finished, edge on the outside. There are many ways to finish the remaining edge of the facing, and on this dress, it has been finished with bias tape (one of my favorite methods). 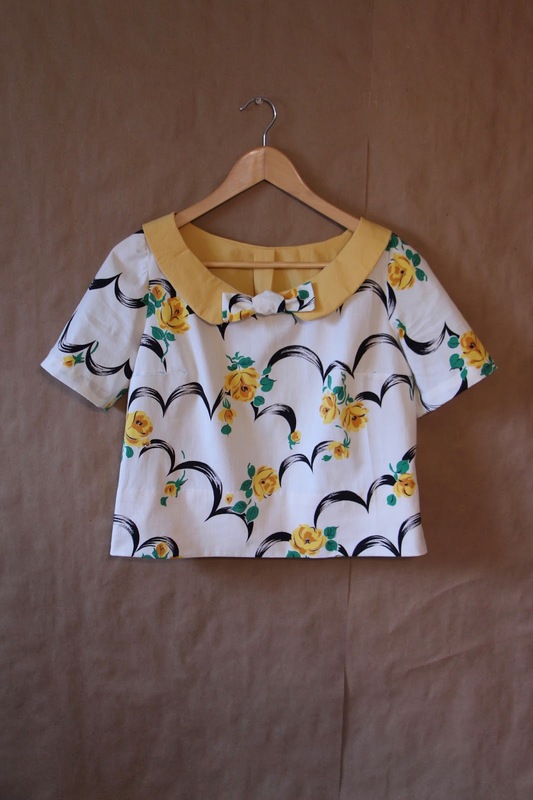 Let's take a look at the inside of this blouse, (McCall's 4933) which I did make, to see a hem facing. This blouse was too short to be finished with a traditional rolled hem so I decided to add a facing to save myself as much length as possible. 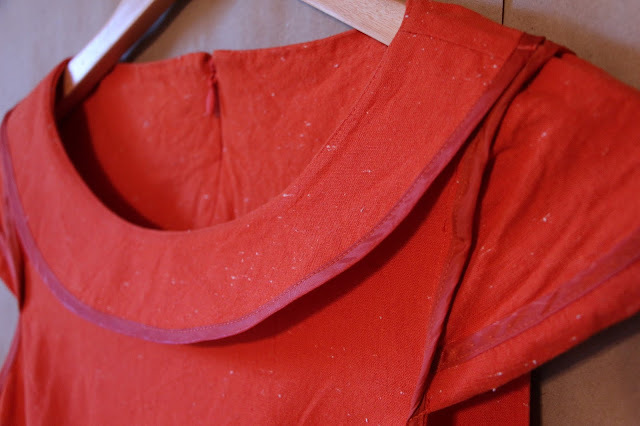 This facing was applied, right sides together, to the outside of the blouse and then turned to the inside. To finish the facing, I turned under the remaining raw edge and then hand-stitched it all the way around. Finishing the hem facing by hand means that there are no visible hem seams from the outside, which I think is a great way to achieve a more professional looking garment. Now let's take a look at the inside of a skirt, which I also made, to see a facing applied to a yoke. 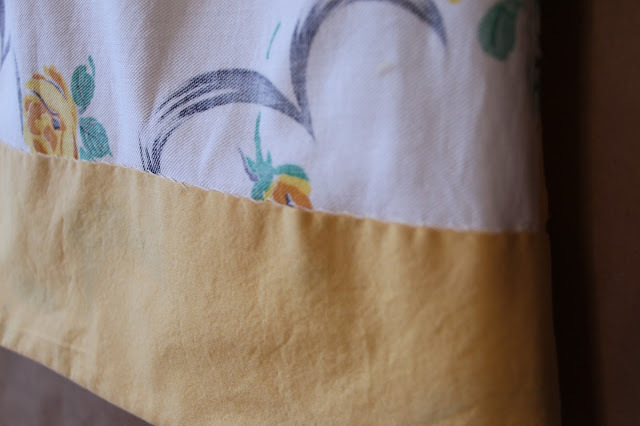 We'll cover yokes in another lesson, but for clarity purposes today, a yoke is a curved panel (typically at the shoulder or hip) that the majority of the fullness of the garment is sewn into. Confused? 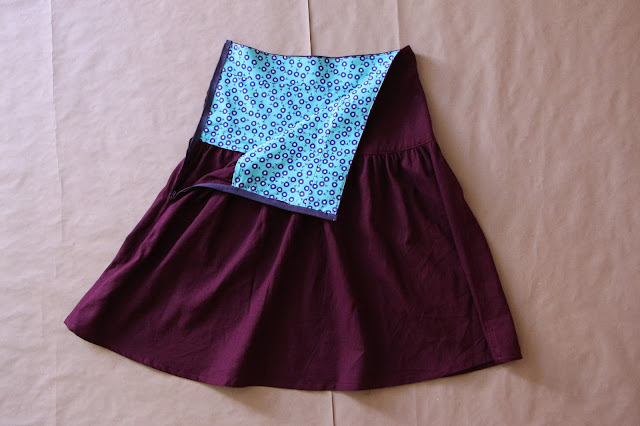 The yoke on this skirt (altered Simplicity 1607) below is the curved part at the top of the skirt. The yoke facing is the blue part on the inside. This facing was, like the previous two, applied right sides together to the outside of the garment, and turned to the inside. 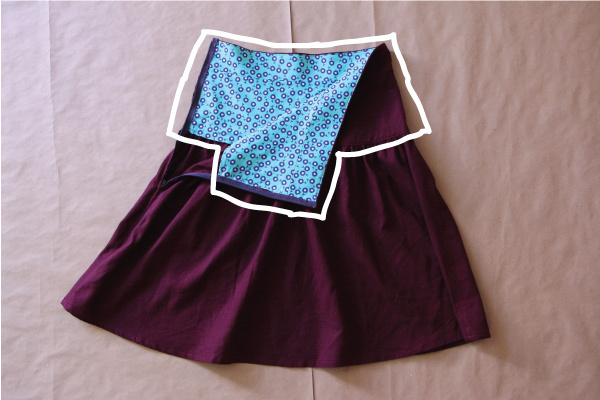 The remaining edge was then turned under and top-stitched from the right-side of the skirt. 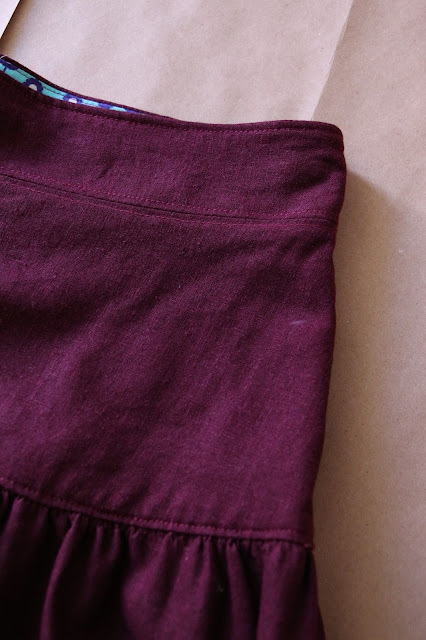 The remaining edge was then turned under and top-stitched from the right-side of the skirt. So there you have three examples of facings. Have a question about a certain type of facing or another general question? Awesome, ask it below! Moving on. Facings can also be thought of as partial linings. Ok, so what's a lining? I couldn't have said it better myself, so I won't try to. 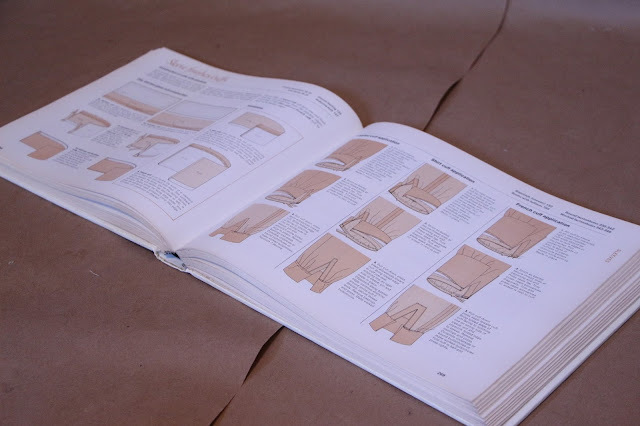 A lining is, according to my book, "applied to the inside of a garment to finish it and to hide the garment's inner construction. No matter wha type of garment it is used in - dress, coat, jacket, pants- a lining is a luxurious as well as functional finishing touch" (pg 80). This is the inside of Vogue 7637, which I made. When we line a garment, we essentially do twice the amount of work (which is perhaps why they're not favored...). 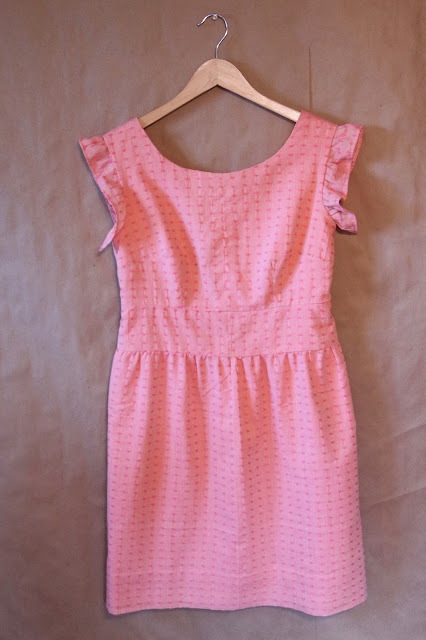 For this dress, for example, I cut double pieces of everything. Two of the skirt (one of the exterior fabric, one of the lining), two of the bodice top (one of the exterior fabric, one of the lining), four of the sleeves (two out of the exterior fabric, two of the lining fabric). 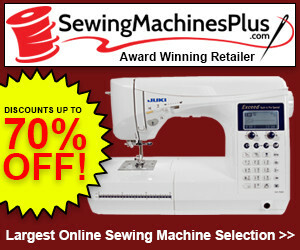 We then sew double the number of seams: four side seams, two hems, four shoulder seams, etc. It's a lot more work, I won't sugarcoat that, but c'mon how good does the inside of this dress look?! The exterior is a 100% wool, and the inside is a soft voile (available for sale here). 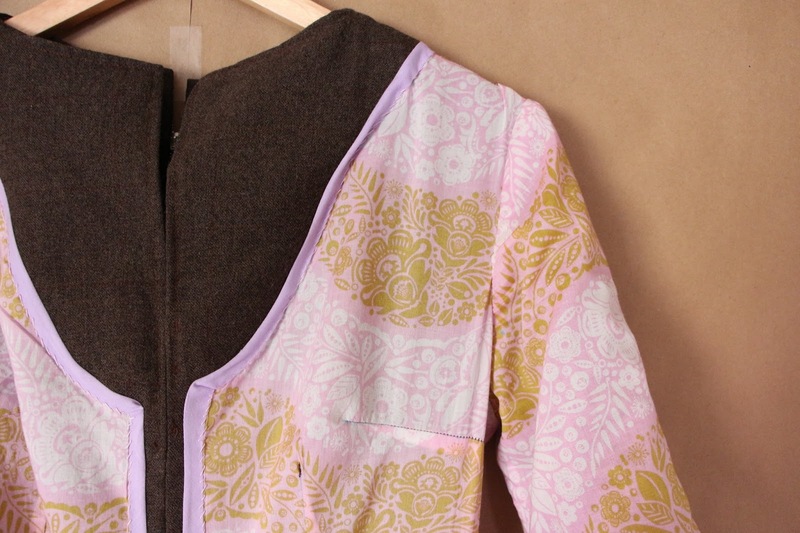 In the picture below you can see where the front neckline facing (the brown part) meets the lining (the purple part)! Chyea! You know what both of those things mean now. 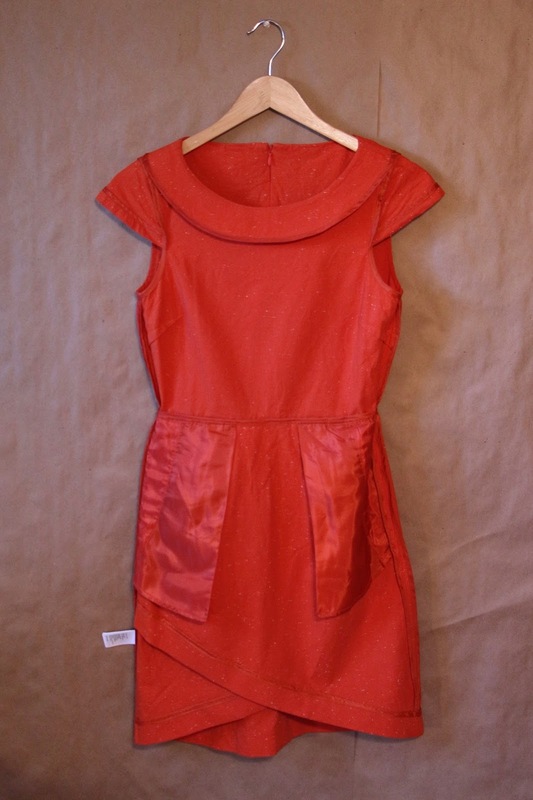 And for clarity's sake here is the exterior of this dress. It's wrinkly because I didn't have time to iron it. Don't judge it because of it's wrinkles. Linings can be attached at several locations. The dress above is attached at the neckline and the sleeve hems and has been tacked (a tack is a couple small hand-stitches) at the waistline. 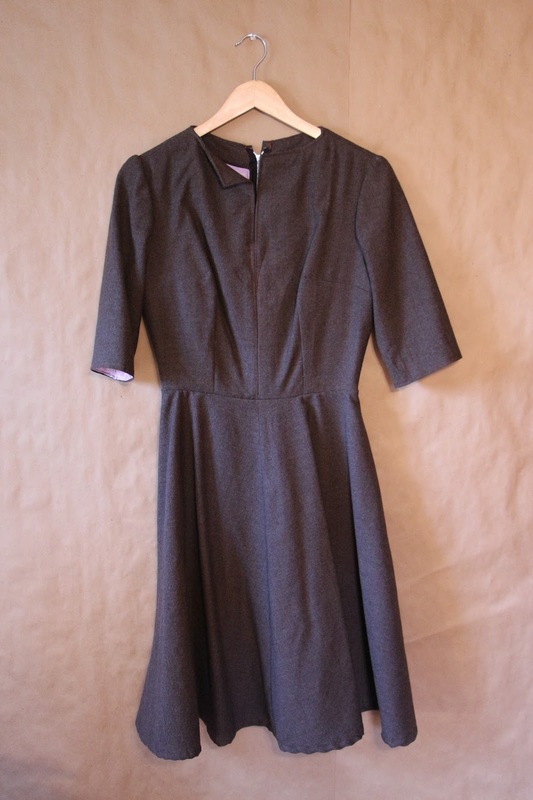 This dress (McCall's 7145) is attached only at the neckline, which is called a free hanging lining. 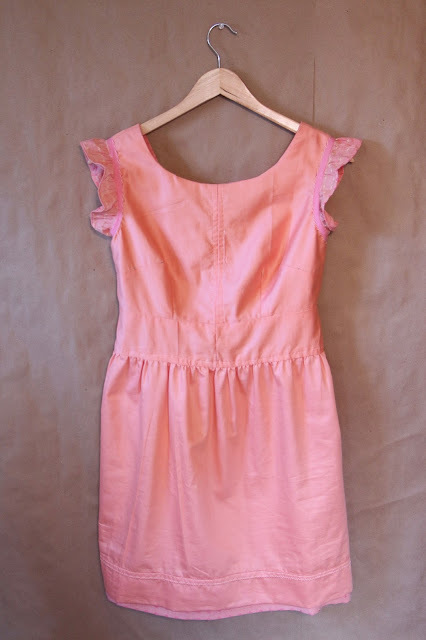 Here is the interior of the dress (it was lined with the most beautiful vintage polished cotton. Insert heart-eyed emoji here). And here is the exterior. notice how you wouldn't even know it was lined from the outside? So, there we have it. Facings and linings. What did I miss?! What questions do you have? You can even send me pictures of a project you're working on or instructions relating to facings and linings that you don't understand. Thank you for reading, I'll see you all again next week for another Sewcabulary lesson!